ARE YOU NOT ENTERTAINED?!?! Well I guess you aren’t yet... But dang it, you will be. Carthage is a game currently being developed in my home town, so I reached out to the makers, and lucky me, I got to try it out for a few rounds. And let me say upfront, a few rounds wasn’t enough. I left wishing I could murderize the other players a few more times. I am totally looking forward to its May 17th kickstarter launch date, and if it doesn’t get funded, I may have to burn down the internet. 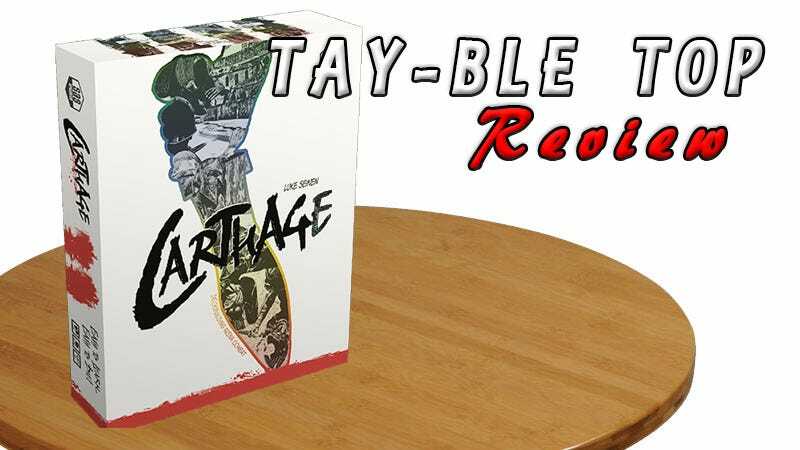 The easiest way to describe Carthage is basically Gladiator the deck building board game, and it plays so good. Each round you fight for board position, attack your fellow players, build up your armor, and win the crowds favor, allowing you to add stronger cards to your arsenal. With its modular rulesets, theater deck, and assortment or arena tokens you can put anywhere on the board, no two games have to be the same. So how does it play? Well let’s jump right on into that shall we? Ah, now the good stuff. Players draw five cards from their deck (if at any point you don’t have enough cards in your deck to draw five cards, shuffle your discard pile, it now becomes your deck again and draw the remaining cards you need). Starting with the first player, each player plays a single card, and resolves all actions. Keep moving around the table till nobody has any cards left to play. Now seems like as good a time as any to go over the symbols on the cards I suppose. Now we get to reap the awards of playing to the crowd. Starting with the last player, players now start spending their favor on a whole mess of options. Purchase new cards - Players can purchase cards from the lineup by paying the favor cost indicated at the top of the card. After a card is purchased it is placed into the players discard pile, and a new card is immediately added to the lineup. Initiate (1 Favor) - A player may spend favor to take the initiative token. This can only be purchased once per round. (We did play one round with a modular rule where it could be purchased multiple times, with the cost increasing by one each time). Focus (3 Favor) - Remove a card from your discard pile and place it in the focus pile. This allows you to get rid of your weak starting cards... Looking at you stumble... so you are more likely to pull your strong cards when you draw a new hand. Evaluate (2 Favor) - Replace all cards in the line up, and if you want/are able purchase one of the new cards by also paying its cost. Lobby (2 Favor) - Did you really like one of those theater cards earlier? This let’s you search the theater discard pile and choose a card to place on top of the theater deck. The Favor phase ends when everyone has either passed or spent all their favor. Remember, favor doesn’t carry over between rounds, anything not spent is lost. I also got to play a 2v2 chain match which was super fun (we all remember that bit from gladiator where the teams are chained together right...). In this mode you are chained to your teammate and can never get further than one square away from them. It really added a level of strategy to the game. My own teammate kicked me, knocking my over one space causing me damage, but lining me up to smash one of the opponents into the crocodile pit. So what’s my problem you may be asking? They are all exactly the same, none of the characters has any special abilities to differentiate them. If it just had maybe some optional replacement starting cards for players who wanted them to feel a little different. Maybe give the Gaul a couple extra knock back cards to start? A bit of extra movement for the Retairius? Carthage is hitting Kickstarter on May 17th, but in the meantime, be sure to check out their website. If you love tabletop games like me, give it a shot, I guarantee* you won’t regret it. TAY Open Forum: "Baby Don&apos;t Hurt Me Again..."